Ah PE lessons, for some the highlight of their school week, for others a cause for absolute dread. From cross-country to cricket, hurdles to hockey, or the two words that would strike fear into even the biggest PE fan: bleep test, come rain or shine there’d always be an allotted time to move your body each week. Fast forward to adulthood and lots of us left the scheduling in of exercise far behind, either through lack of time, boredom or emotional scarring from the bleep test. Whilst we can’t give you more time (or bleep test related therapy), we can at least help with beating the boredom that comes with trying the same sports or routines over and over again with our pick of some classes for some extracurricular athletic inspiration. In the words of Olivia Newton John, let's get physical. Calling all fans of the Netflix show GLOW. If you loved the gorgeous ladies of wrestling and wondered how you’d fare in the ring, now’s your chance to find out. EVE Pro-Wrestling prides itself on challenging the idea of wrestling being a male dominated sport and is all about promoting “ground-breaking feminist-punk-rock wrestling.” With classes running weekly at their Eve Academy London’s School of Women’s Wrestling in Bethnal Green, you can build up your wrestling techniques and choreography, as well as developing your own character whilst having fun and improving your fitness. Even Zoya the Destroyer would approve. EVE Pro-Wrestling is located at Resistance Gallery, 265 Poyser Street, Bethnal Green, London, E2 9RF. Shout out to all those amongst you who secretly hoped a well-timed downpour would coincide with the weekly PE lesson so that you could swap running laps for the joys of indoor sports. King of the cancelled PE class was ping pong, and for anyone who still can’t get into the full-on sporty spirit, why not re-live your youth with a trip to Bounce. No longer the rainy day back-up plan, this is ping pong ramped up to 11 thanks to the creatively designed setting, delicious cocktails and pizza to fuel your ping pong prowess. The emphasis is on the more social side of competitiveness, so it’s perfect for a fun night out. If you never quite gave up your childhood pastime of rollerskating up and down your street, and taking a few tumbles along the way never put you off trying again, then perhaps Roller Derby is the new team sport for you. Started in the US, Roller Derby sees two teams scoring points by a player called the jammer lapping the defensive blockers. It’s fast, furious but incredibly fun! With a big scene in London and regular social skating sessions, it’s in increasingly popular hobby presided over by the fantastic London Rollergirls. There are various wickedly named teams in the league (think Batter C Power and Brawl Saints) but their Fresh Meat programme offers a chance for new recruits to learn skating skills and derby rules on a rolling basis, no pun intended. So what are you waiting for? Get your skates on! Find out more about London Rollergirls on their website. Alongside naps and zero responsibility, one of the things we miss most about being a kid is playtime. Imagine getting 20 minutes every morning to just run around and play instead of having to work. Well, whilst we don’t recommend running out into the work carpark with your jacket like a cape every 11am, we do definitely recommend getting involved with Rabble. With meet-ups across London, Rabble is a group that offers HIIT workouts in the form of playing games. Open to all, each hour session involves various games including playground classics such as British Bulldog and Dodgeball (if you can dodge a wrench you can dodge a ball) as well as their own version of The Hunger Games (without all the, y’know, murder). Rabble mixes PE with playground fun so it’s ideal for anyone hoping to get fitter without the gym routine, and to make some new friends, especially as most of their sessions are followed by a trip to the local pub. Find out more about Rabble on their website. If you liked the competitive nature of Rugby or Hockey at school but wanted something with a little more edge to it, or if you simply want to channel your inner Jon Snow, then step into the arena that is sword fighting. London Longsword Academy teaches you to use a range of weaponry to master in a friendly and safe environment with skilled professionals in their field of this martial art. 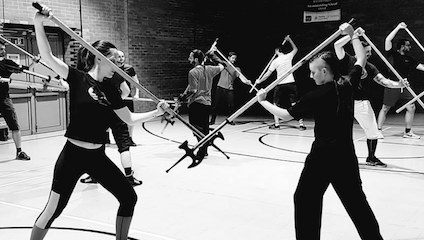 You have the choice between four different classes a week focusing on weapons from rapiers to longswords, as well as private lessons being available for those wanting to really hone their technique. Sure, it may not be the kind of physical skill you can show off in the park, but you’ll definitely feel pretty badass. Check out London Longsword Academy’s locations and class timetable on their website.